Hmm I am having trouble looking up the shrink rate of flumo. But if it is significant this could be an issue for me. 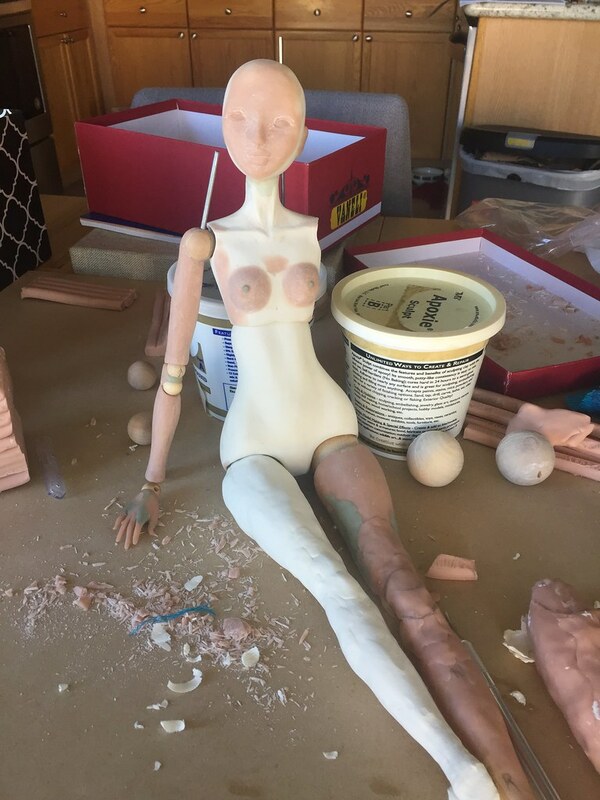 However, I DID plan to make my master parts in porcelain, so I have made my sculpey prototype doll roughly 2 sizes larger than I intend for the final product to be. I realize there may be some margin of error, but I do believe my final product should be between 13 and 14 inches if my starting point is where it is, which is roughly 21 inches. I could also cast my next set in wax to refine my parts, which was my original plan. I know that wax has a very minor shrink rate. When I discovered flumo I was thinking of doing that instead because the idea of wet casting is not ideal and I have not worked in wax before so there is a learning curve. Also, because I will be unable to get my sculpey parts as refined as I was hoping before moving on to wax or porcelain, the flumo gave me some freedom to work with air drying clay like ladoll, or adding sculpey, so that they could be as refined as possible before my next step. I would prefer to avoid making many, many molds of pieces which are too unrefined. Trying to fix the proportion of the legs, I made a bigger knee joint but now I think maybe too big. I am considering scrapping this version of the legs and beginning new with them again. We will have to see how it goes! I also need to edit the arms; shorten the upper arm and lengthen the lower arm. But I may wait until my first mold stage to do this. So many smaller edits to do too which can wait for molds 1.0. I also am trying some paperclay now, but, ugh, it takes so long to dry! Well done on progress .. you have amazing patience but it is really paying off! Thank you so much for the tips Dina! It is always a challenge when you start with a new material. And, thank you, it can be hard to take things slow but, I hope my end product is better for it in the long run!